Facing the defending World Series champion Pirates, Cardinals starter Pete Vuckovich performed a high-wire act in the 1980 season opener. Vuckovich pitched a three-hit shutout in the Cardinals’ 1-0 victory on April 10, 1980, at St. Louis. It was the first of only two times the Cardinals won a season opener by a score of 1-0. The second occurred March 31, 2014, against the Reds at Cincinnati. In the 1980 game, Vuckovich performed a Houdini act by striking out the side with runners on second and third in the ninth. Using a variety of off-speed pitches called by catcher Ted Simmons, Vuckovich retired 14 Pirates in a row between the first and sixth innings. The Cardinals got a run against Bert Blyleven in the second when Bobby Bonds, in his Cardinals debut after being acquired from the Indians, walked and scored on a George Hendrick double. Vuckovich held the Pirates to two hits through eight innings, but in the ninth it began to unravel. Pinch-hitter Lee Lacy led off with a single, Omar Moreno walked and a wild pitch enabled the runners to advance to second and third with none out. “We couldn’t ask to be in a better situation,” Pirates manager Chuck Tanner told United Press International. Tim Foli, who the year before was the toughest National League batter to strike out, stepped to the plate. Next, Dave Parker, who was nicknamed “The Cobra” for his ability to uncoil quickly and lash line drives. Willie Stargell, destined for the Hall of Fame, followed. First base was open and John Milner was on deck, but Vuckovich opted to pitch to Stargell. Vuckovich delivered 111 pitches, striking out nine and walking two. “Today was an emotional drain,” Vuckovich said to the Associated Press. The performance earned Vuckovich the admiration of everyone who witnessed it. 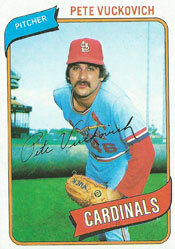 Vuckovich finished 12-9 with three shutouts and a 3.40 ERA for the 1980 Cardinals. After the season, Vuckovich, Simmons and reliever Rollie Fingers were traded to the Brewers. Vuckovich led the American League in winning percentage in each of his first two years with the Brewers and won the 1982 Cy Young Award. Thanks for your comment. I know what you mean. I remember listening to this game on radio and squirming through that 9th inning.